24 out of 24 (100.00%) customers would recommend this product to a friend. I'm a teacher and always looking for a way to save money and the toner price is the best. And it lasts as long as the more expensive ones. I got two cartridges for half the price of one from the big box stores. Highly recommend! The quality of the product was as good, if not better than a new OEM toner cartridge. Works perfect, WAY Cheaper than HP and arrived faster then predicted. Great product, i will continue ordering. I would recommend this product to any office or home office. Price was within my budget for this item. Works just as well as the original. Would definitely recommend. Love the price for same quality of OEM in other stores. Was paying $70+ per cartridge. Our office switched to shared printers and if we wanted to keep our desktops, we had to pay for the toner ourselves. After several years of struggling with refilled toner cartridges. we decided to look elsewhere. We landed on Ink Technologies and have been there ever since. About 3 years and never a problem. We'll order our toner from Ink Technologies until we close our doors. Thanks for the awesome product you provide. Excellent cartridge replacement for our HP M401 printer. Print quality is as good as name brand - No problems with size compatibility or function. Would highly recommend this cartridge for applicable compatible printers. The price is right and it is just as good as the brand name product. I have easily paid more than $80 for a single one of these cartridges. The shipping was fast and the print quality is excellent. I will definitely purchase again. Buying this for the first time. So far it is good. The product seems to yield more copies than advertised. Clean and free of mess. Never have a problem with defects. This product is way better than the original and produces way more copies! This lasts for over a week! I save money and get original/authentic quality! I have not had any problems whatsoever with the toners I have purchased. No dislikes so far... Anyone looking for a great price on toners-buy here! I bought these products in bulk because I knew that they're cheaper that way. The quality is the same as the original. However, this product lasts way longer than the original. This works so much better than the original and lasts so much longer!! For a much cheaper price! I would recommend this product to any business office. The cartridge lasts a long time even though I print a lot of worksheets regularly. The cartridge was easy to install and it arrived very quickly. Great product! Glad I found this website! A video covering the new compatible CF280A toner cartridge, which replaces the original OEM HP cartridge. The video also includes installation instructions. 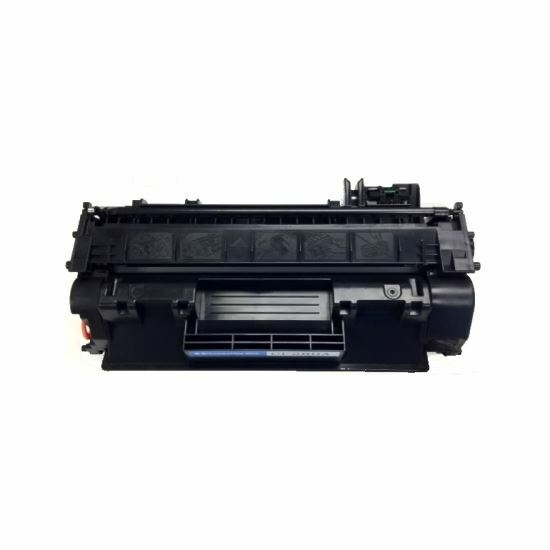 The CF280A toner cartridge contains black toner, and as the smaller of two options, it offers around 2,700 pages, estimated based on 5% page coverage. With a weight of 2.7 pounds, it is not too difficult to install, and it is only about 13.4 inches wide. The first thing to do is remove the CF280A cartridge from its box, and remove the packing materials and the plastic bag. Rock the cartridge side to side to help redistribute the toner inside, as it may have settled during shipping. Find the black paper protecting the drum and pull it away from the cartridge in the direction the arrows are pointing. Remove the packing tape by placing one finger inside the loop and pulling it straight out. Press the toner button at the top right of the printer and lower the access panel down. The HP CF280A toner cartridge has a handle on its front. Grasp the handle and pull the cartridge toward you. Align the new compatible CF280A toner cartridge with the guide rails on the sides, and slide it all the way in. Press firmly to make sure it is seated completely, then raise the access panel. You can now resume printing. The CF280A cartridge is compatible with several LaserJet Pro models including several variations of the M401, such as the M401d and M401dw. It is also compatible with models in the M425 series, such as the M425dn and M425dw. For a complete list of CF280A compatible printers, see the “Fits Printer Models” tab.